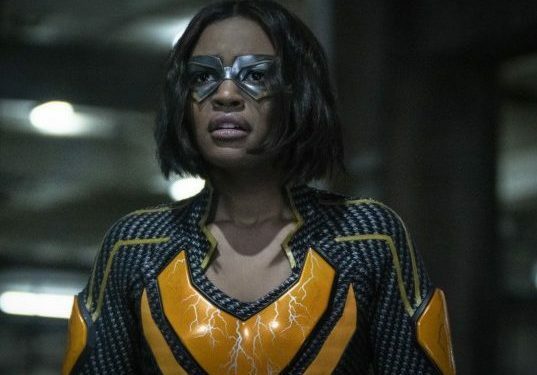 We're back (well some of us) for the final episodes of Black Lightning and boy is it a doozy. In the final three episodes, they resurrect just as many characters including Lala, who is apparently immortal because Lazarus (played by the inimitable Michael Wright) brought him back from the dead twice. Also back from the dead are Reverend Holt, who doesn't know what a podcast is because he's using it to call people to the church during a riot and Khalil, who Agent Odell has been keeping in a pod along with Wendy and Issa. If all that isn't crazy enough for you, the teleporting meta we met about 5 episodes ago, returns looking for Dr. Jace. Apparently, he's a Markovian mercenary sent to retrieve her because the Markovians have an army of metas in pods they want to launch. And Tobias, who has been building his own metahuman army all season, abandons that plan in a fit of rage so he can terrorize Black Lightning. His plan immediately backfires when the disoriented pod kids just wander off into the streets of Freeland without attacking. So if you're thinking, did ANY of plot we were building this season matter? The answer is no. We've had sixteen episodes just to end up with Jennifer in a suit. Tobias turned out to be a straw man and now the Markovians are the big bad for season 3 even though the show has done little to nothing to introduce them as a credible threat. Black Lightning may not be a lost cause but if we're going to enjoy this show, we're going to have to turn our brain off. We'll see if things change next fall but for right now, it's a wrap for the Pierces.